From the middle of the 18th century, Dresden’s electors, kings, architects and artists turned this eastern German city into one of the world’s greatest cultural locations. Its nickname ‘Florence on the Elbe’ signifies its importance to European history and culture. Dresden’s historic Altstadt (old town) was destroyed by Allied bombs in February 1945, leaving little more than rubble. The city has been slowly rebuilt since, and is some way towards regaining some of its lost cultural prestige. Elector Friedrich August I is arguably the most important person in the history of Dresden’s cultural evolution into a world-class city of art and architecture. Modelling himself on France’s Louis XIV, he spared no expense in creating a prestigious royal capital. By the end of his reign in 1733, Friedrich August had created a baroque jewel in Saxony, renowned for art, architecture and music. His legacy also includes setting up the Meißen porcelain works, the first in Europe to discover the importance of kaolin in making porcelain. Johann Sebastian Bach composed the Mass for the Dresden Court in 1730, reflecting the growing reputation the city had for attracting talented composers as a focal point for European culture. A century later, Richard Wagner spent 20 years in the city, serving as the leader of the court orchestra. Other musical greats include Richard Strauss, who premiered many of his operas in the city in the first half of the 20th century. The most famous German painting created during the romantic period owes its brilliance to Caspar David Friedrich, who lived and worked in Dresden for most of his life. Standing tall on a rock, back to the viewer and mountains in the background, The Wanderer above the Sea of Fog (1818) is for many critics the personification of the philosophy of this late-18th-century romantic movement. While Caspar David Friedrich created what is arguably the most famous image by a Dresden resident, unarguably the most famous image of the city was created by the great Italian artist Canaletto. His 1748 Dresden as Seen From the Right Bank of the River Elbe Below the Augustus Bridge depicts the cityscape in unsurpassed baroque glory. 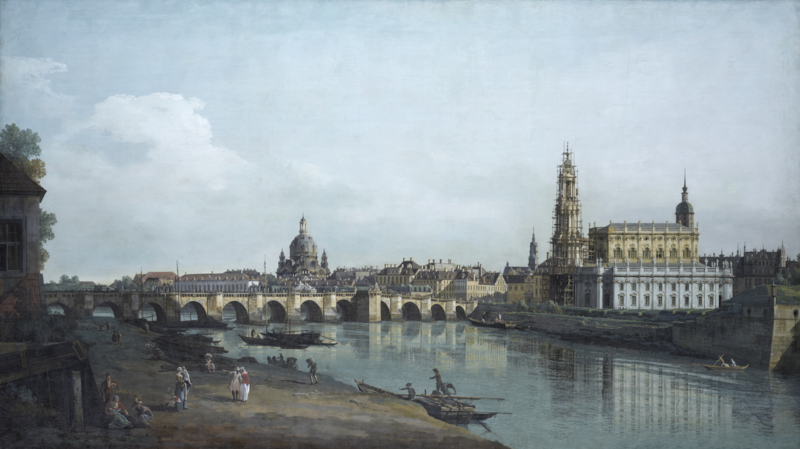 Visitors can see it at Dresden’s Old Masters Gallery in the Semperbau at the Zwinger. Ernst Ludwig Kirchner, Fritz Bleyl, Erich Heckel and Karl Schmidt-Rottluff came together as a group in Dresden in 1904–1905 and created the group Die Brücke (the Bridge). Later, with other collaborators, they put on more than 70 art shows over eight years, and their expressionist style inspired numerous artists and movements, such as Wassily Kandinsky’s Blaue Reiter (Blue Rider) in Munich. The utter destruction of central Dresden during World War II was not only a human and physical disaster; it also destroyed the city’s centuries-long cultural heritage. The baroque city par excellence was obliterated, and there was little prospect that any of the world’s best cultural talents would be tempted to work there. The most enduring cultural legacy of these terrible years surely resides with Viktor Klemperer, a professor of linguistics who survived the Holocaust in Dresden. He also survived the Dresden firestorm, and after the war published The Language of the Third Reich, with his remarkable I Shall Bear Witness diaries published in 2005. One of Dresden’s most famous postwar sons is Helmut Schön, who became one of the most successful international football managers Germany has ever had. He made a career as a player with local side Dresden, and after fleeing East Germany after the war, eventually became West German manager, reaching the final of the 1966 World Cup and losing to England in the final. His team won the 1974 tournament against the Netherlands in Munich’s Olympic Stadium. Another Dresden-born cultural icon also made it big once he left behind his native city and communism for the West: Gerhard Richter, born in Dresden in 1932, is one of the world’s biggest names in contemporary art, and the city’s Albertinum holds his archive, with many of his works on display at the New Masters Gallery.